The vast schools of glass minnows that were with us recently seem to have left the area. With them went the big schools of tarpon and mackerel but the croaker, whiting, and snook are hanging in there. I have fished with my son Randy, and friends Marty Barlow and Barry Rashkin, for the last couple of days and the bite has been excellent. Tiger Shores and Stuart Beach have been the locations and the action has been from early morning to after the tide change. After catching what we wanted to take home, we played catch-and-release as there were just that many fish present. Randy had a nice snook grab a Fishbite and take off down the trough the other day and the hope is that when the snook season opens on Saturday, these great fish will still be chasing the croaker along the beach. Every year it seems the slot-sized fish know how to read a calendar and do a vanishing act right after the season opens! The whiting and croaker on the other hand, are increasing both in size and numbers. This bite has been on fire and shows no sign of letting up. If you aren't catching them you are probably pitching your Fishbites too far. Remember: 5 to 10 yards has been the maximum distance we have targeted to put together a nice catch. The latter part of this holiday weekend looks like the weather is going to go down hill as a system approaches and the wind and rain enter our local area. Monday and Tuesday look like possibly the worst days of the week, so get out and fish Saturday and Sunday. There has been lots of 5 to 8 inch pompano in the surf and this is a normal occurence before the keeper sized fish start to show up. Its a great time of year to be a surf fisherman as the mullet run, pompano season, and great whiting and croaker fishing are all part of the near future. Heres a quick seminar update for those folks that have been asking about a date and time. I will be doing Surf Fishing the Fall Mullet Run on Saturday ,Sept. 15 at Bass Pro Shops - Port St Lucie at 245 pm in front of the aquarium. This one always produces a big crowd so come early and get a good seat. I will also be presenting the same seminar for the folks in the Ft Lauderdale area at Bass Pro Shops -Dania Beach on Sunday Sept 16. I do not have the exact time but whwn I get notified I will post it immediately. Hope to see you there. There is still a decent snook bite at the St. Lucie Inlet, but the fish are definitely beginning to make their way back into the rivers. Anglers using live shrimp and working the dock lights along the river at night are faring well catching snook as well as sea trout and redfish. Snook are also being caught at the Jensen Causeway on jigs and jigs tipped with shrimp. Tripletail are being caught on the channel markers. At the Boynton Inlet, there have been some large snook and tarpon spotted hanging around the outside sandbar on the incoming tide. 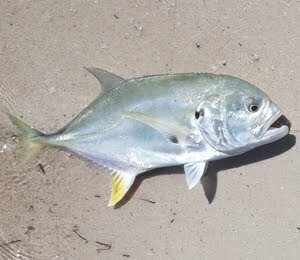 Jetty fisherman have been catching mangrove snapper and jack crevalle. On the Lantana Bridge, anglers are catching tarpon on live threadfins, sheepshead on oysters and mangrove snapper on live shrimp. There has been an excellent morning bite for bass on the south end of the lake. Both live shiners and several artificial baits are producing excellent results. For artificial, Gambler Aces and Zoom Super Flukes are working well. The surf bite continued through the weekend with tarpon, spanish mackerel, jacks, whiting, croaker, blue runner, and snook all bending rods along the beaches. 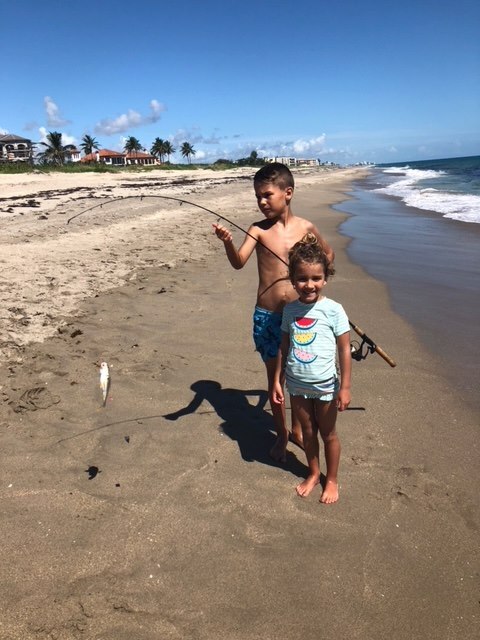 A return to Stuart Beach on Saturday morning proved to be the most memorable day that my son Danny and grandkids will remember when they think about their vacation here on the Treasure Coast. My 8-year old grandson Christian was casting his Krocodile spoon and catching spanish mackerel and big big blue runners on a steady basis. I was fishing a little south of him when I heard a scream and watched a 100-pound tarpon going airborne with Christian holding on for dear life, with his 7 foot spinning rod and a Penn Battle 4000, bent over double. He was lucky enough to get a second jump from this beautiful fish before the fish spit the spoon out, and I know that memory will last a lifetime. The croaker and whiting bite became secondary for the last day we were on the beach, and Christian concentrated on trying to hook another tarpon. On Sunday the big schools of glass minnows had moved from Stuart Beach and reports received told of a big concentration on the south end of Bathtub Beach. Looking at the webcam this morning, I saw lots of pelicans at the Jensen Beach location, so be mobile and look at the beach you are planning to fish before you set up. Find the schools of bait and you will find the fish. Don't be afraid to throw some of the smaller artificials, whether its a spoon, like a small Krocodile, or a smaller YoZuri Crystal Minnow. The spoon that was hot for us over the weekend was a 3/4 ounce silver and blue Krocodile. EPIC BEACH TARPON BATTLE ON 10 LB. GEAR!!! INSHORE: Catch and release(this weekend you can invite one home for dinner) snook fishing remains the best inshore bet right now. The mullet run hasn't really reached us yet; but the first trickles of mullet are showing. Look for the snook to bite best at night around the bridges on an outgoing tide. Jupiter and Palm Beach Inlet are both still producing good numbers of snook as well. The Hobe Sound Flats continue to hold a surprising number of fish for this time of year. Good mixed bag action of snook, spotted seatrout, redfish, mangrove snapper, and a few others. Scattered reports of a few tarpon moving around further up the Loxahatchee River. 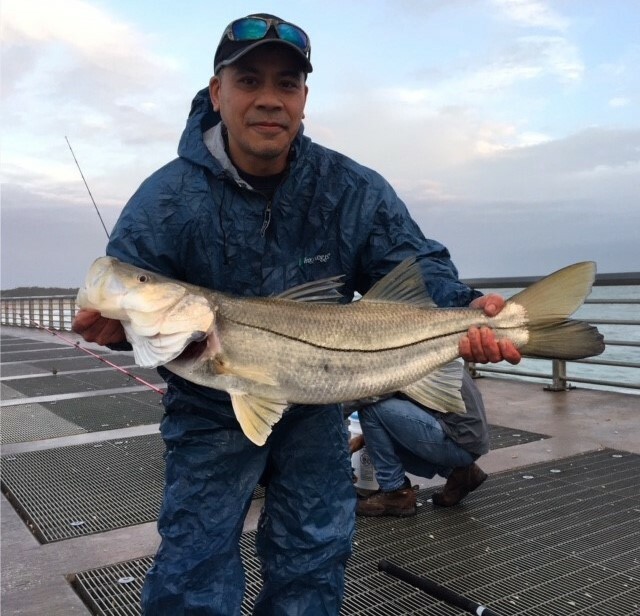 Snook season officially opens on September 1 and we know many of you will head out to the North Jetty as a prime fishing spot. A reminder to obey the rules and be good to your fellow fisherman out there! Go see Tommy Turowski at the Sebastian Inlet Bait & Tackle to get the best advice on how to reel one in.. FWC allows for one snook, per harvester, per day and total length of not less than 28″, no more than 32″. 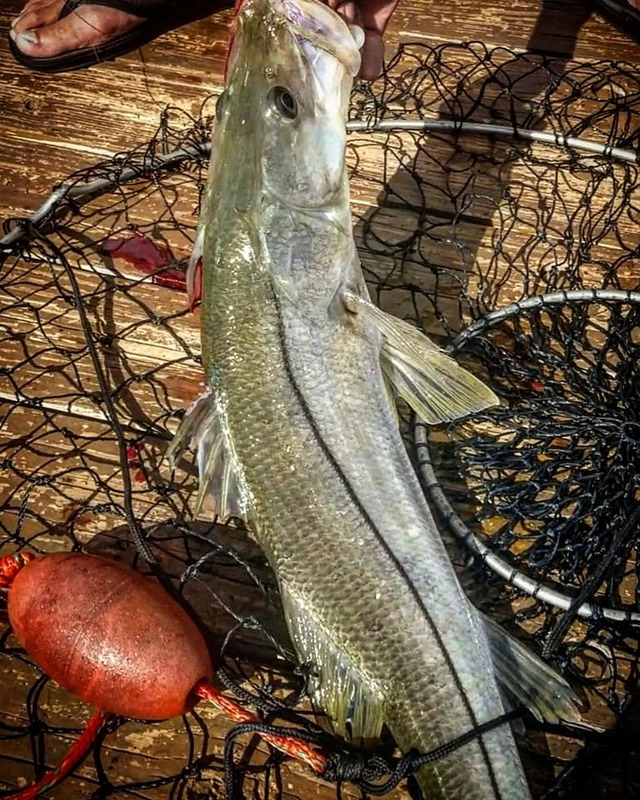 A snook permit, as well as a recreational saltwater license, is required. Check out the Florida Fish and Wildlife Conservation Commission website for all rules and regulations. Unique to the region, Snook are one of the many reasons Florida is the fishing capital of the world. When releasing a Snook, proper handling methods can help ensure your fish’s survival and the species abundance for anglers today and for generations to come. Life and action on the beach is fantastic. The schools of glass minnows continue to draw in everything from bonita to croaker, and based on what I saw today this great fishing should go on for some time. I walked onto Stuart Beach this morning and had a fisherman tell me he had the best surf fishing action he had ever experienced in one morning. His catch list included spanish mackerel, bonita, blue runners, and jacks. I got to my spot and the tarpon, mackerel, blue runner, and jacks were tearing the glass minnow schools to shreds. 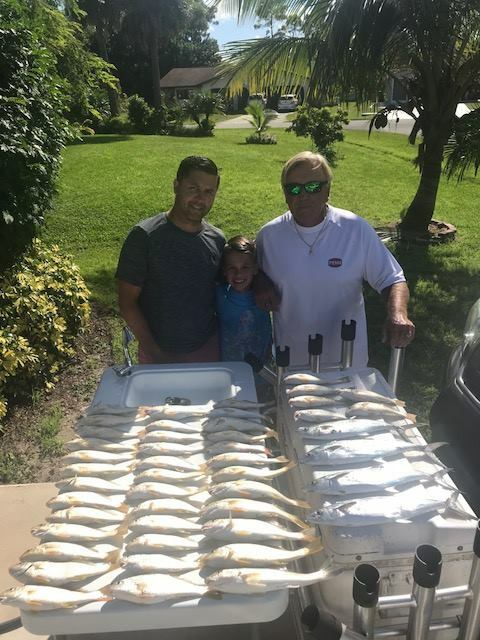 By the time my son Danny and grandson Christian quit fishing, we had put 40 to 50 big croaker and whiting in the cooler along with a few nice spanish mackerel. We released lots of mackerel and big blue runners through out the morning and left the croaker and whiting biting. 8-year old Christian became a pro at casting the Krocodile spoon, hooking and fighting numerous spanish mackerel and blue runners all morning. Small pieces of Fishbites were all that was needed to catch the big croaker and whiting. The key to catching the largest croaker and whiting was to pitch your baits into the middle of the glass minnow schools and right after the bait settles to the bottom, the strikes are instantaneous. Almost all of the fish I filleted were stuffed with glass minnows. The best tarpon action has been during the low light periods of dawn and dusk, so if that is your targeted species plan your trips accordingly. The forecast looks good for the next few days so get out and bend a rod. 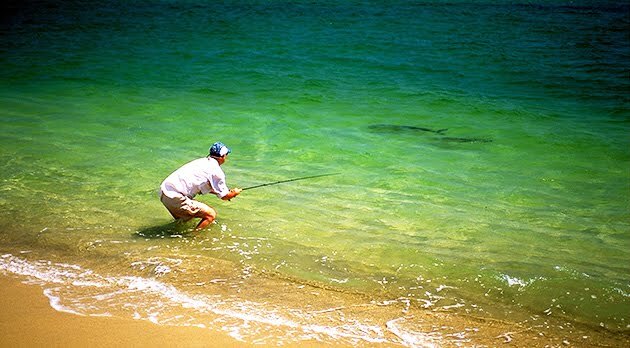 These fish are spread up and down Hutchinson Island, so just find a beach with glass minnow schools and I am sure you will be successful. The inshore bite has been the typical summer time bite. Go early or go late. The tripletail have been active around the channel markers and taking the bigger shrimp. The snapper bite is still good along the channel edges and they are taking the smaller shrimp or small white baits. A few reds were reported yesterday from the docks along North Indian River Dr. - most were under slot. 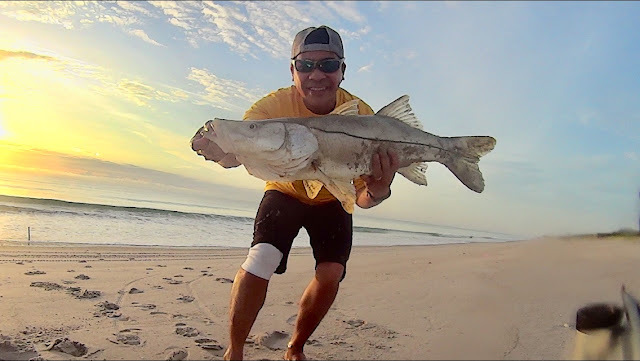 The catch and release snook bite has been good along the beach and in the Ft. Pierce Inlet. The snook and tarpon have been feeding on all the glass minnows. Tarpon, snook, barracuda, jack crevalle and snapper have been hitting around the Boynton Inlet jetties. 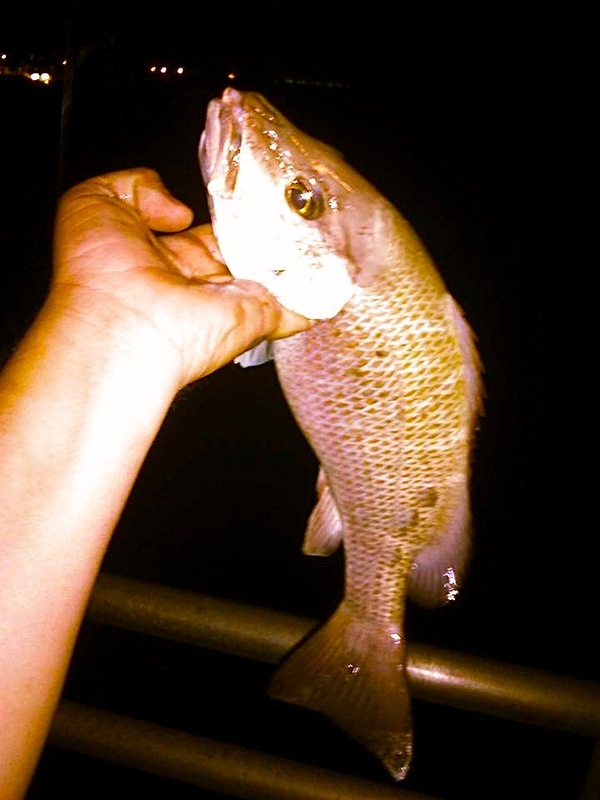 At night, anglers fishing off the south seawall have been catching snapper on cut shrimp and moonfish on white jigs. Tarpon, barracuda and jack crevalle have been hitting slow-trolled shallow diving lures along the Intracoastal Waterway channels and deep seawalls off Ocean Ridge. Mangrove snapper, sheepshead, jack crevalle, tarpon and snook have been hitting live shrimp and live herring around the Lantana Bridge. Night action for snook and tarpon using live bait or artificial lures is a best bet. The bass fishing on the lake is still excellent in the early morning. From daybreak until about an hour-and-a-half after, white swim jigs are working well. After that, anglers switching to Senkos, either in blues, black or red shad, are faring better flipping and pitching. King’s Bar, Bird Island and Harney Pond are the top spots right now, but the key has been locating and fishing around the Kissimmee Grass. Using chrome and blue Rat-L-Trap lures, anglers also have been catching bass in some of the boat lanes. Though the panfish fishing has been a bit slow, anglers working the rim canals are getting enough for some good dinners. True fishermen spend hours and hours paying there dues... I sure have in the past, most don't understand why, specially wives and bosses.We do it for the rare occasion when it actually works. My boss asks sometimes when am I coming in to work, it goes like this... Boss. well when? Me: my car broke down at the fishing spot and it won't start till low tide?. Boss: well when is that ? Me: I don't know do you have a tide chart handy? He knows he isn't going to see me till the fish stop biting. Don't know why we keep having the same coversation? Back to when it actually works, I was born a snook alcoholic I admit I have to go to snook anonymous... During the summer I sometimes get up to 6 hits a day. The other night just every worked, I am not exaggerating we caught billions. no really.. I brought a knife to a gun fight, with this little bass rod, which I sleep with, the wife almost rolled over on it once so we had to get different bedrooms. I tell young fishermen every man should at least once own a nice truck, Make love to a woman he loves, and fish with a Gloomis mrb844c 7' IMX bass rod. The other night after 20 or so double hooks ups, which has happened .... never before. I threw this little bait on this tiny rod right next to a piling and this snookasourus hit it like I had ran over brick with a lawnmower. Kinda like hooking into a VW bug going 40 mph. I yanked on her to keep her away from the piling and she didn't even know I was there... she ran down the docks and since she didn't know I was there she made a 90 turn away from the docks. Big mistake for her, good luck for me. My buddy would not pour his beer on my smoking reel... called it alcohol abuse. She was running like an atheist at a Baptism. ut oh ...she is going under the boat. I felt like I was using one of the zebco kids fishing poles. With a ton of luck, and a blessing from the man above, I managed to land her. the problem was holding her up. Last thing I would want to do would be to hurt her. I have found out most fishermen are terrible photographers.. but this is all we have of this "EPIC" night fishing None the less I will never forget this "encounter". Of course we went back the next day, and those snook packed there bags.. all gone. Tarpon, snook, jack, spanish mackerel, ladyfish, blue runner, whiting, and croaker all showed up along our beaches this weekend. A big push of bait, which included glass minnows and greenies, was the trigger for some great action for those that fished the County Line Beach area on Saturday and Sunday. As we get closer to the fall mullet run expect these bait blow-ups to start occurring at numerous locations. 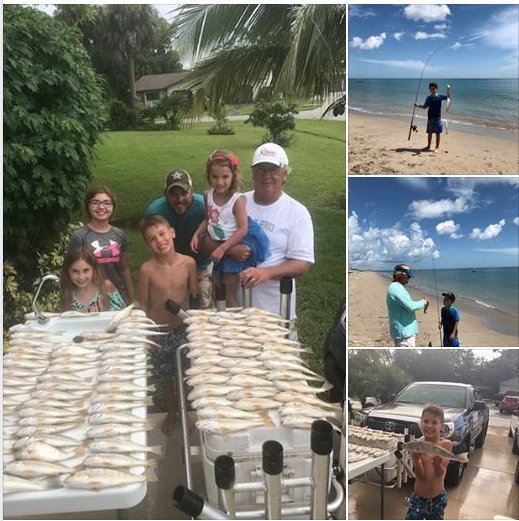 I returned to Stuart Beach on Sunday with Randy and my grandkids, and probably had one of the best whiting and croaker days of the summer. The croaker were the bulk of the catch, but Randy caught our biggest whiting of the year. It was non-stop action for most of the morning, and my grandson Christian pulled in multiple doubleheaders of nice croaker. We were doing a fish fry in the afternoon so the timing could not have been better. Pink Shrimp and Orange Clam Fishbites were once again the go-to bait. Sand fleas were thick at Stuart and I managed to get enough big ones to start putting some in the freezer for the upcoming pompano season. This week's weather forecast calls for a slight increase in the wave heights as we approach the weekend, but conditions look fishable all week. High tides will be from 10 am to1 pm as the week progresses. 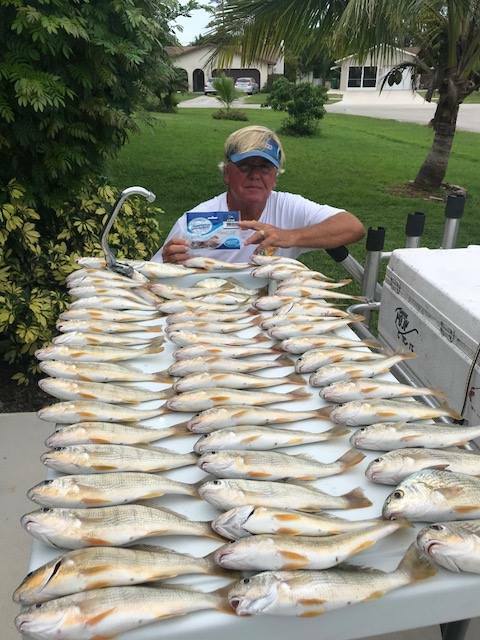 Fishing has been pretty good with lots of Mangrove Snapper, some Mutton Snapper, Redfish and Jacks off the north jetty as reported by our friends at Sebastian Inlet Bait & Tackle. Go see Tommy there for the latest update! NOAA forecast calling for light south/southwest winds this week and less than 3-foot seas, noting the west wall of the Gulf Stream is 21 nautical miles east of Sebastian Inlet. Thanks to Allan Noel for sending in this photo as we get ready to kick off Snook season on September 1. Mark your calendars and until then, remember to catch and release. Unique to the region, Snook are one of the many reasons Florida is the fishing capital of the world. When releasing a Snook, proper handling methods can help ensure your fish’s survival and the species abundance for anglers today and for generations to come. A snook permit, as well as a recreational saltwater license, is required. Its been a tough week so far for anyone who has tried to fish the beaches due to a continuing SE wind that has been keeping the surf roughed up and the weed supply ongoing. As far as our local surf fishing is concerned it appears as if the wind is going to subside somewhat and change direction fom the steady E-SE we have been experiencing. It wont be too long before we will be talking about the Fall Mullet Run . Last year it was the third week of August when some "scout"schools of bait surprised me at Tiger Shores during a whiting and croaker trip.Big Jacks, Tarpon, Snook, and sharks will all be present when these bait schools start showing. The snook fishing at the St. Lucie Inlet and the docks along the St. Lucie River, especially Hell’s Gate has been excellent. Tarpon fishing at the Crossroads, the Jensen Causeway and Big Mud by the power plant has been good as well. Snook fishing at the Jupiter and Lake Worth spillways is also good right now. Swimbaits are working well. 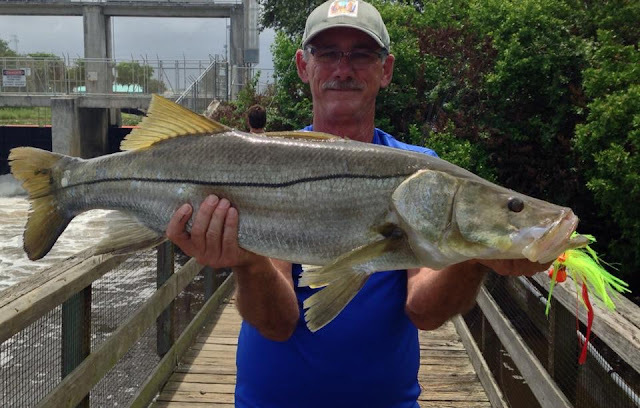 Fishing around the Boynton Inlet has been good for snook, tarpon, mangrove and dog snapper. Anglers fishing the inlet at night are catching permit using whole squid or live crabs. In the Intracoastal Waterway there are tarpon rolling in the channel and bonefish and barracuda providing excellent action for anglers fly fishing the flats west and north of the inlet. Crazy Charlie Flies are working for bonefish and Needlefish Flies have been good for the barracuda. The Lantana Bridge has been holding lots of baitfish including small threadfin herring and anglers are using them to catch short mutton snapper, mangrove snapper, jack crevalle, snook and tarpon. Moonfish are hitting small yellow or white jigs at night around the bridge. Remember, if fishing for snook it’s catch and release only until the season opens on Sept. 1. On the lake the bass bite is still firing in the mornings! Swim jigs, spinnerbaits and chatterbaits are working well. Around mid- to late-morning anglers switching over to beaver-style baits or flipping jigs are reporting the best action. The bite backs off in the afternoons, but picks back up in the evenings with live shiners working well. King Bar’s is still one of the hot spots and a few areas on the east side including J&S and Henry Creek are also working well. Bluegill are still biting in the rim canal and the river and are hitting worms, crickets and beetle spins. Looking for a fight? 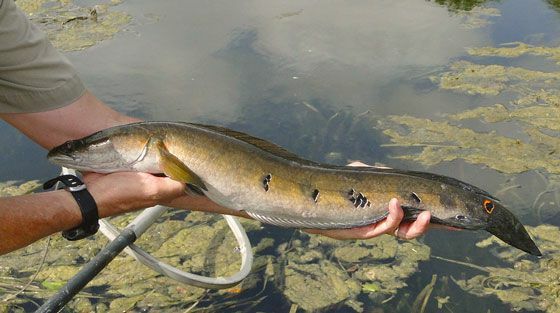 Hard-fighting bullseye snakeheads are hitting top water frog lures early in the morning and Streamer Flies in the afternoon along the banks of both lakes and their adjoining canals. The summer fishing has been great and should remain steady through August with lots of bait in the river and along the coastline. Lots of juvenile tarpon can be found rolling back in the St. Lucie River 7-9am. Getting them to eat can be challenging, but we’ve hooked them on DOA TerrorEyz and shrimp. For fly fishing, try throwing the Midnight Magic, puple/black, or chartreuse clousers and zonkers with intermediate or sinking line. If nothing else works, try free lining live shrimp on a circle hook. Theses 10-30 lb. tarpon can also be found at the inlet. The larger tarpon can be found at the Crossroads, inlet, and beaches early morning. Try pitching live mullet 9-12”, greenies, pilchards, or threadfins.